You will be given a Free reference e-book to read which has 631 pages And the test will be based on that e-book. What is a Certified Informaton Systems Auditor? A certified information systems auditor refers to a designation which is globally recognized. It refers to a professional who has successufully passed the certified information systems auditor certification test and finally received a certification recognized internationally which is specialy designed for information system audit control, security and assurance. Receiving a certification in this field works in showcasing your skills, knowledge and experience in the field of auditing while also demonstrating your capability in managing vulnerabilities, guaranteing compliance and in making sure that proper audit controls are being instituted within a business enterprise. It should be noted that the certified information systems auditor test is open for all individual who are greatly interested in the field of information systems audit, security and control. The usual coverage of the exam reflects the most essential and evolving duties and responsibilities of all aspiring IT and information systems auditor. These include auditing information system processes, IT management and governance, acquisition, implementation and development of information systems, operations, support and maintenance of information systems and information assets security and protection. It also covers the development and implementation of IT audit strategies based on risk that comply with the most relevant auditing standards for information technology. All these topics are extensively explained in the free CIST practice course introduced by Brainmeasures so getting the highest form of learning regarding the field is greatly possible. The free study guide and practice test in this free online practice course are necessary in getting yourself prepared for the exam. A free certified information systems auditor test is one of the many things that you will enjoy upon deciding to enrol in the free CISA practice course which is now introduced to the public. What makes this free practice test from Brainmeasures so powerful at present is its effectiveness in maximizing the level of your familiarity about how the actual certified information systems auditor certification exam is conducted. This will equip you with all the information needed for you to make all the necessary preparations for the test. This free CISA practice course is also equipped with a free study guide which extensively and thoroughly explains everything that you need to learn about the field especially those topics that usually form part of the CISA certification exam coverage. All these features of the practice course are really beneficial in your attempt to easily and correctly answer all the questions in the certification test. 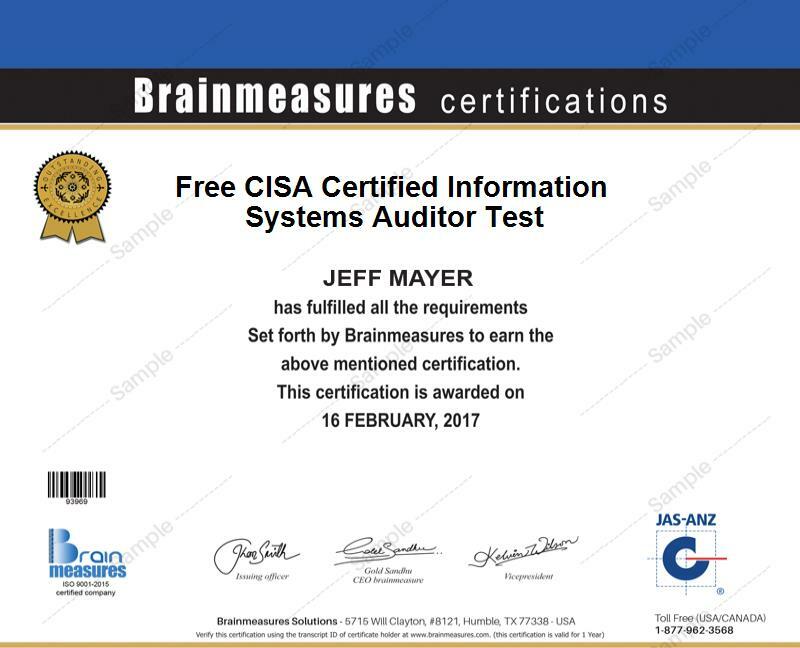 Taking up the free certified information systems auditor test included by Brainmeasures in its free CISA practice course can really help a lot of aspiring professionals in this field handle the certification exam well. It targets all aspiring certified information systems auditors, financial, external and operational auditors and any other professionals who intend to completely understand the most vital risks and controls in information technology so they can easily pass the CISA exam. Being a holder of a certified information systems auditor certification is definitely a major help in boosting your present salary. Your certificate works in helping you grab the position of a certified information systems auditor (CISA) and receive approximately $60,000 to $130,000 every year. You can also use your certificate to become an information systems audit manager and enjoy annual earnings of approximately $73,000 to $143,000.